The Health Professions Council (HPC) is yet another regulatory quango. At present the HPC regulates; Arts therapists, biomedical scientists, chiropodists/podiatrists, clinical scientists, dietitians, occupational therapists, operating department practitioners, orthoptists, paramedics, physiotherapists, prosthetists/orthotists, radiographers and speech & language therapists. But then came the Pittilo report, about which I wrote a commentary in the Times, and here, A very bad report: gamma minus for the vice-chancellor, and here. Both the Pittilo report, the HPC, and indeed the Department of Health itself (watch this space), seem quite unable to grasp the obvious fact that you cannot come up with any sensible form of regulation until after you have decided whether the ‘therapy’ works or whether it is so much nonsense. In no sense can “the public be protected” by setting educational standards for nonsense. But this obvioua fact seems to be beyond the intellectual grasp of the quangoid box-ticking mentality. That report recommended that the HPC should regulate also Medical Herbalists, Acupuncturists and Traditional Chinese Medicine Practitioners. Even more absurdly, it recommended degrees in these subjects, just at the moment that those universities who run them are beginning to realise that they are anti-scientific subjects and closing down degrees in them. How could these three branches of the alternative medicine industry possibly be eligible to register with the HPC when one of the criteria for registration is that there must be “practise based on evidence of efficacy”? Impossible, I hear you say. But if you said that, I fear you may have underestimated the capacity of the official mind for pure double-speak. The HPC published a report on 11 September 2008, Regulation of Medical Herbalists, Acupuncturists and Traditional Chinese Medicine Practitioners. could be resolved so I sent a list of questions. The full letter is here. “Our Council considered the report at its meeting in July 2008 and decided that the regulation of these groups was necessary on the grounds of public protection. The Council decided to make a recommendation to the Secretary of State for Health that these groups be regulated. happen to teach mythical nonsense. Later the reply got into deeper water. Yes, based on process and structures (without engaging the brain it seems). Rather reminiscent of the great scandal in UK Social Services. It is right in one respect though. The evidence base is indeed growing, But it is almost all negative evidence. Does the HPC not realise that? And what about “at least by Western standards”? Surely the HPC is not suggesting that UK health policy should be determined by the standards of evidence of Chinese herbalists? Actually it is doing exactly that since its assessment of evidence was based on the Pittilo report in which the evidence was assessed (very badly) by herbalists. Yes of course the Pittilo report said that, because it was written by herbalists! Had the HPC bothered to read Ben Goldacre’s column in the Guardian they would have realised that there is no barrier at all to doing proper tests. It isn’t rocket science, though it seems that it is beyond the comprehension of the HPC. So that sounds fine. Except that research is rarely published in “journals that are accepted as learned by the health sciences”. And of course most of the good evidence is negative anyway. Nobody with the slightest knowledge of the literature could possibly think that these criteria are satisfied by Medical Herbalists, Acupuncturists and Traditional Chinese Medicine Practitioners. So what does the HPC make of the evidence? Appendix 2 tells us. It goes through the criteria for HPS registration. There is no mention that the “body of knowledge” is, in many cases, nonsensical gobbledygook and, astonishingly this criterion was deemed to be “met”!. Evidence of efficacy. There is limited widely accepted evidence of efficacy, although this could be partly explained by the nature of the professions in offering bespoke treatments to individual patients. This criterion is scored part met overall. they said anything negative). it is no wonder that the judgement is overoptimistic! Did the HPC not notice the quality of the evidence presented in the Pittilo report? Apparently not. That is sheer incompetence. Nevertheless the criterion was not “met”, so they can’t join HPC, right? Not at all. The Council simply decided to ignore its own rules. On page 5 of the Council’s report we see this. The Steering Group [Pittilo] argues that a lack of evidence of efficacy should not prevent regulation but that the professions should be encouraged and funded to strengthen the evidence base (p.11, p. 32, p.34). This question can be a controversial area and the evidence base of these professions was the focus of some press attention following the report’s publication. An often raised argument against regulation in such circumstances is that it would give credibility in the public’s eyes to treatments that are not proven to be safe or efficacious. In terms of the HPC’s existing processes, a lack of ‘accepted’ evidence of efficacy is not a barrier to producing standards of proficiency or making decisions about fitness to practise cases. This strikes me as ludicrous, incompetent, and at heart, dishonest. There will be no sense in policy in this area until the question of efficacy is referred to NICE. Why didn’t the HPC recommend that? Why has it not been done? One possible reason is that I discovered recently that, although there are two scientific advisers in the Department of Health,. both of them claim that it is “not their role” to give scientific advice in this area. So the questions get referred instead to the Prince of Wales Foundation. That is no way to run a ship. The fact of the matter is that the HPC, like so many other regulatory agencies, fails utterly to protect the public from fraudulent and incompetent practitioners. In fact it actually protects them, in the same way that the financial ‘regulators’ protected fraudulent bankers. They all seem to think that ticking boxes and passing exams is an effective process. Even if the exams require you to memorise that amethysts “emit high Yin energy so transmuting lower energies and clearing and aligning energy disturbance as all levels of being”. With impeccable timing, Duchy Originals has just launched a “detox” product. Duchy Originals is a company that was launched in 1990 by the Prince of Wales, Up to now, it has limited itself to selling overpriced and not particularly healthy stuff like Chocolate Butterscotch Biscuits and Sandringham Strawberry Preserve. Pretty yummy if you can afford them. The move of HRH into herbal concoctions was first noted in the blogosphere (as usual) in December, by Quackometer. It was reported recently in the Daily Telegraph (23rd January). Aha so it is a “food supplement” not a drug. Perhaps Duchy Originals have not noticed that there are now rather strict regulations about making health claims for foods? And guess who’s selling it? Yes our old friend, for which no deception is too gross, Boots the Chemists. That’s £10 for 50 ml. Or £200 per litre. Problem 2. There isn’t the slightest reason to think that either artichoke or dandelion will help with anything at all. Neither appears at all in the Cochrane reviews. So let’s check two sources that are both compiled by CAM sympathisers (just so I can’t be accused of prejudice). National Electronic Library of CAM (NELCAM) reveals nothing useful. There is no good evidence that artichoke leaf extract works for lowering cholesterol. No other indications are mentioned. Dandelion doesn’t get any mention at all. The US National Center for Complementary and Alternative Medicine (NCCAM) has spent almost $1 billion on testing alternative treatments So far they have produced no good new remedies (see also Integrative baloney @ Yale).They publish a database of knowledge about herbs. This is what they say. Dandelion. There is no compelling scientific evidence for using dandelion as a treatment for any medical condition. Artichoke isn’t even mentioned anywhere. If “detox” is meant to be a euphemism for hangover cure, then look at the review by Pittler et al (2005), ‘Interventions for preventing or treating alcohol hangover: systematic review of randomised controlled trials’. Problem 3. The claim that the product is “cleansing and purifying” is either meaningless or false. Insofar as it is meaningless, it is marketing jargon that is designed to deceive. The claim that it supports “the body’s natural elimination and detoxification processes, and helps maintain healthy digestion” is baseless. It is a false health claim that, prima facie, is contrary to the Unfair Trading law, and/or European regulation on nutrition and health claims made on food, ref 1924/2006 , and which therefore should result in prosecution. Duchy are selling also Echinacea and Hypericum (St John’s Wort). The evidence that Echinacea helps with colds is, to put it mildly, very marginal. These two are slightly different because they appear to have the blessing of the MHRA. The behaviour of the MHRA in ignoring the little question of whether the treatment works or not has been condemned widely. But at least the MHRA are quite explicit. This is what the MHRA says of St. John’s Wort (my emphasis). But that bit about “There is no requirement under the Traditional Herbal Registration scheme to prove scientifically that the product works” does not appear in the Duchy Originals advertisement. On the contrary, this is what they say. On the contrary, anyone without specialist knowledge would interpret bits like these as claims that there will be a health benefit. That is claim to benefit your health. So are these. Michael McIntyre is certainly a high profile herbalist. Sharpen up for that interminable meeting. We left the herbs to our wonderful herbalists. Their De-tox contains lemon, lime, ginger, sarsparilla and angelica. I expect it tastes nice. All the rest is pure marketing rubbish. It does not speak very well of Michael McIntyre that he should lend his name to such promotions. Nelsons, who actually make the stuff, is better known as a big player in the great homeopathic fraud business. They will sell you 30C pills of common salt at £4.60 for 84. Their main health-giving virtue is that they’re salt free. If you want to know what use they are, you are referred here, where it is claimed that it is “used to treat watery colds, headaches, anaemia, constipation, and backache”. Needless to say there isn’t a smidgeon of reason to believe it does the slightest good for them. And remember what Nelson’s advisor at their London pharmacy told BBC TV while recommending sugar pills to prevent malaria? The Prince of Wales has some sensible things to say in other areas, such as the world’s over-reliance on fossil fuels. Even his ideas about medicine are, no doubt, well-intentioned. It does seem a shame that he just can’t get the hang of the need for evidence. Wishful thinking just isn’t enough. Some more interesting reading about the Prince of Wales. 11 March 2009 The MHRA have censured Duchy Originals for the claims made for these products. and in May 2009, two complaints to the Advertising Standards Authority were upheld. Herbal nonsense at the Royal Society of Medicine and, ahem, at UCL Hospitals. Herbal medicine is, unlike homeopathy, not ridiculous, It is merely Pharmacology, as practised up to circa 1900. Whereas good trials have now shown acupuncture to be sham and homeopathy to be a placebo, there has been very little good research on herbs. Most herbalism could fairly be described giving to sick patients an unknown dose of a substance with unknown efficacy and unknown safety. How odd, then, to visit the Royal Society of Medicine to be greeted thus. Just look at the words! and that is total nonsense. TCM provides no understanding and virtually none of it is known to be useful for treating anything. Another poster at the RSM exhibition provides some of the explanation. What on earth, one wonders, do they mean by “making efforts to modernise TCM “? So far, the idea of modernising TCM doesn’t seem to include any great effort to find out if it works. Much of the promotion of TCM seems to be not so much ‘ancient wisdom’, but modern nationalist propaganda by the Chinese government. The history is fascinating, but you won’t learn it from the posters on display at the exhibition. Singh & Ernst Trick or Treatmant, page 46. Rose Shapiro, Suckers, how alternative medicine makes fools of us all. Why is the Royal Society of Medicine allowing such mendacious posters? As it happens, I and a friend were visiting the RSM to see their Academic Dean, with a view to finding out why the RSM had failed to take any public position on alternative medicine. The answer appeared to be money, and that was the answer to why the TCM exhibition was being held on their premises too. The Dean no more believed in TCM than we did, but, well, they need the income. He pointed out (looking suitably sheepish) that the address given for the exhibition was not the RSM, but Number 1 Wimpole Street (that, of course, is also the address of the RSM). Ah, so that’s OK then. It has to be said that the RSM isn’t alone in its spineless attitude. Both the British Medical Association (BMA) and the Royal College of General Practitioners (RCGP) have failed to make any clear condemnation of mystical medicine. This is in stark contrast to just about every relevant scientific society (here is a summary). It is a mystery to me why much of medicine should still be dominated by a mindset that seems to have lagged 200 years behind every other science. Perhaps medicine is just too complicated. Make no mistake, University College London Hospital is top class. The UCLH Trust. runs seven hospitals All but one of them are excellent. But in 2002 the Royal London Homeopathic Hospital was acquired as part of the UCLH group, to the intense embarrassment of UCL scientists. Let’s start with the good bit. Usually I don’t like anecdotes, so just think of this as a vote of thanks, not evidence. a subarachnoid haemorrhage when she was seven months pregnant. After misdiagnosis at St Peter’s Hospital, Chertsey, she was moved to UCH and diagnosed very quickly. The next day she had neurosurgery to pin an aneurysm at the Maida Vale Neurosurgical Hospital, part of the UCLH group (it no longer exists). The surgeon, Alan Crockard, came out of theatre after five hours, looking rather tired and said “it was adhered to the optic chiasma on one side and about a millilmetre from the pituitary on the other. It was a bit tricky but I think we got it”. After a week in intensive care, under heavy sedation, Margaret’s blood pressure was not low enough and they decided to deliver the baby. 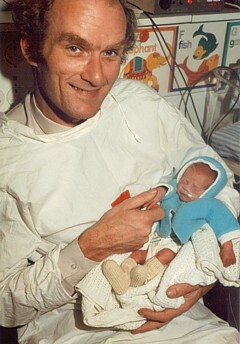 At about 4 pm on a snowy Christmas Eve, a team of neurosurgeons and a team of obstetricians gathered and soon after, Andrew Stuart Colquhoun emerged in a small incubator to be whisked off in an ambulance to the Special Care Baby Unit at UCH (run, at that time, by Osmund Reynolds).. Christmas day was spent in the hospital, with Margaret’s mother. Andrew weighed 1.4 kg at birth, but by Christmas day he had pulled out his ventilator himself, and was doing fine. He was so tiny that it was a couple of days before I dared to hold him. The Unit had racks of doll-sized clothes, knitted by volunteers. Andrew (at 9 days) and Dad. Jan 2, 1985. Click for album..
Now they are both fine.and Andrew is 6′ 7″ (200.5 cm).. It is episodes like this that make one very proud of the NHS. Heaven knows what it would have cost in the USA. Andrew playing cricket in Bangladesh, Feb 2005. Recently I was sent the UCLH Annual Review 2007 – 2008. There was a lot of good stuff in it and worth a read despite there being too much hyperbole and too many pictures of men in dark suits. But buried among all the high tech stuff, what do we find but an advertisement for 1900-style pharmacology in the form of the herbal clinic at the Royal London Homeopathic Hospital, accompanied by a load of utterly inaccurate information from the TV botanist, David Bellamy. Unbelievably, they are actually boasting that it is the first herbal clinic in the UK to be based in an NHS hospital. In fact, of course, it is a step backwards by about 100 years. Times in May 2006). No doubt the advocates of mystical medicine are trying to fill the gaps left by the departure of some of the homeopathy. . There have been problems before with the herbal activities at the RLHH before (see Conflicts of Interest at the Homeopathic Hospital). It appeared that the Khans, who run the Marigold homeopathic podiatry clinic (no, seriously, it is real) were largely prescribing a herbal product that was made by their own company. without even the hospital trust, never mind the patients, being made aware of it. In normal medicine this would be regarded as a rather serious offence, but as far as I know, nothing was ever done about it. The ethics of alternative medicine are truly one of life’s great mysteries. Reading further in the annual review, we come to the page about the RLHH. The homeopathy side must really have run down because it seems to have diversified into selling cosmetics and groceries. That sounds like desperation. Good heavens, they sell “chemical-free sun cream”. One wonders what it can be made of, if not chemicals. This is the language of low-grade advertising agencies, not what one expects from an NHS hospital trust. But next to this there is a much more interesting item. Just look at the last sentence. I wonder if this could possibly have anything to do with the fact that Michael Baum and I visited the Trust headquarters in August 2006 to propose that the RLHH might be turned into a centre of supportive and palliative care? with herbalism and acupuncture, we won’t be much closer to the 21st century. We know they are under pressure from their royal patrons, but that, in a constitutional monarchy, is simply not acceptable. Michael Baum is a cancer surgeon who has taken a particular interest in palliative and supportive care. He is someone whose views should be taken seriously. He is also the author of the magnificent “An open letter to the Prince of Wales: with respect, your highness, you’ve got it wrong” Here is a quotation from that letter. The UCLH Trust should bear it in mind. The power of my authority comes with a knowledge built on 40 years of study and 25 years of active involvement in cancer research. I’m sensitive to the danger of abusing this power and, as a last resort, I know that the General Medical Council (GMC) is watching over my shoulder to ensure I respect a code of conduct with a duty of care that respects patients’ dignity and privacy and reminds me that my personal beliefs should not prejudice my advice. Your power and authority rest on an accident of birth. Furthermore, your public utterances are worthy of four pages, whereas, if lucky, I might warrant one. I don’t begrudge you that authority and we probably share many opinions about art and architecture, but I do beg you to exercise your power with extreme caution when advising patients with life threatening diseases to embrace unproven therapies. There is no equivalent of the GMC for the monarchy, so it is left either to sensational journalism or, more rarely, to the quiet voice of loyal subjects such as myself to warn you that you may have overstepped the mark. It is in the nature of your world to be surrounded by sycophants (including members of the medical establishment hungry for their mention in the Queen’s birthday honours list) who constantly reinforce what they assume are your prejudices. Sir, they patronise you! Allow me this chastisement. Baum is a truly good man. The photo album chronicling the birth of my son, is really just for family and friends, but at least one blog picked up on the wider significance. The Times today has given s good showing for my comment piece. It gives the case against following the advice of the Pittilo report. It simply makes no sense to have government regulation of acupuncture, herbal medicine, traditional Chinese medicine until such time as there is evidence that they work. It makes even less sense to have BSc degrees in them. The Department of Health should have more sense that to use the Prince of Wales as its scientific advisor. Let’s hope that the recent example set by the University of Central Lancashire is the start of trend for vice-chancellors to appreciate that running such degrees brings their universities into disrepute. The Pittilo report to the Department of Health will endanger the public and corrupt universities. There is a better way. I like that much better than “Regulate quack nedicine? I feel sick”. But, oh dear, the picture that I sent them is on the left, but what appeared is on the right. Spot the difference. Well now, at least, I can feel I have something in common with Isambard Kingdom Brunel. It so happens that Professor Pittilo wrote a letter to Times Higher Education this week. I fear that it provided a yet more evidence that he hasn’t really quite got the hang of evidence. The Lancashire Evening Post catches up with the UCLan story, two days after you read it here. in the Times on Sept 2. Sir, Professor Colquhoun’s campaign to discredit our report (“Regulate quack medicine? I feel sick,” Aug 29) is in danger of placing public health at risk. He is entitled to challenge existing evidence for the effectiveness of complementary and alternative medicine (CAM) but fails to acknowledge the key recommendation from the steering group on the essential need to demonstrate efficacy, safety and quality assurance as a prerequisite for NHS funding. Professor Colquhoun dismisses CAM because of the absence of a rigorous scientific foundation and he asserts that to teach and practise it is unethical. Survey data consistently demonstrates very high demand for CAM with one report estimating that 22 million visits involving 10.6 per cent of the population in England alone occurred in 2008. This demand is one reason why his alternative model of trade law enforcement will not work. He may argue that these people are uncritical recipients of nonsense, but data from the Medicines and Healthcare products Regulatory Agency confirm that they are at significant risk from poor practice. It is essential that we protect the public by implementing statutory regulation alongside demanding evidence of efficacy. Professor Colquhoun’s resistance to the teaching of science to CAM practitioners will do little to help them to critically evaluate effectiveness. And Pittilo wrote in similar vein to Times Higher Education. Your feature on some members of staff at the University of Central Lancashire attacking science degrees in complementary and alternative medicine (“Staff attack science degrees in alternative health”, 7 August) raises a number of concerns. in acupuncture and Chinese herbal medicine “contain significant elements of science”. benefit is essential if National Health Service resources are to be made available to fund these therapies. There is no doubt that courses that provide a solid scientific foundation will greatly assist CAM practitioners in establishing evidence-based practice. It would be most unfortunate if the reported resistance to degree titles led to those wishing to practise acupuncture or herbal medicine receiving less hard science than they might have. To say that acupuncture and herbal medicine degrees have no academic justification appears arrogant in the extreme. Although it is certainly true that some content may not be scientific, this does not invalidate the legitimacy of these courses at degree level, a fact borne out by their successful validation in a number of universities. R. Michael Pittilo, Principal and vice-chancellor, The Robert Gordon University. (1) “It is encouraging to note from the feature that new courses in acupuncture and Chinese Herbal medicine “contain significant elements of science”. For many alternative therapies the “philosophy” is simply incompatible with science. One obvious example is homeopathy. On Mondays and Wednesdays (science days) the students will be required to learn that response increases with dose. On Tuesdays and Thursdays will be taught the opposite. But for the exam they must reproduce only the latter (nonsensical) idea because their aim is to get a job as a homeopath. That makes nonsense of the idea of a university. (2) His report “recognises the significant challenges in developing a strong research and evidence base for complementary and alternative medicine (CAM)”. This seems to constitute a recognition that the evidence is still very inadequate. The time to start degrees, and the time to give official government recognition, is after the evidence is in, not before. What happens if you start degrees and then find that the subject is so much nonsense? Well, that has already happened in several areas of course. But the people who accredit the course and who act as external examiners just happen to be fervent believers in that nonsense, so all appears to be well (to bean counters anyway). No, it is not a matter of arrogance, just a matter of careful attention to the evidence. Attention to evidence was notably absent in Prof Pittilo’s report, perhaps because his committee consisted entirely of people who earn their living from the subjects they were supposed to be assessing. (5) “ . . a fact borne out by their successful validation in a number of universities”. I have had the misfortune to have waded through a mound of such validation documents. The one thing they never consider is whether the treatment works. Sad to say, these validations are not worth the paper they are written on. UCL felled by a herbalist? On Friday 1 June, 2007, when it was announced that the IMPROBABLE SCIENCE page had been moved from the UCL server, several people sent letters to the provost. Here is one of them. I have never met Prof Shafer, but his letter, and other similar ones, lightened an otherwise bad day. Dear Dr. Grant:I am very sorry to learn that you have requested Dr. Colquhoun to remove his “Improbable Science” web page from the computer system at University College London. It is particularly disheartening to learn that you made this request after receiving a complaint from a practitioner of nonscientific medicine. I don’t know how many of your faculty publish in Nature (Colquhoun D. Science degrees without the science. Nature. 2007;446:373-4). However, based on my experience at Stanford, I would guess precious few. You now appear to be attempting to squelch his academic freedom, or at least disassociate UCL from his efforts to educate the public about quack science. Perhaps you were put off by the “unprofessional appearance” of the web page. If so then you have misunderstood its purpose. The public is inundated by junk science, A large portion come from the Internet. There are almost no Internet resources where a lay reader can find a counterweight to the extensive claims of pseudoscientists. Dr. Colquhoun’s blog is a unique resource. The format may put off a scientific reader, but it is exactly the format required to get the message to the web surfer with a 10 second attention span. In my view the Improbable Science web page was among the most important public services made available by the University College London. It is thus with shock, sadness, and disappointment that I have learned of this decision by the University College London. I hope that you will reconsider. The present course makes it appear that UCL has caved in to pseudoscientists and is engaged in academic censorship of possibly the most important public service offered by the UCL. No doubt it is an exaggeration to say “the Improbable Science web page was among the most important public services made available by the University College London”. But thanks anyway. After an unrepentant response, Professor Shafer replied thus. Dear Provost Grant:I appreciate your taking the time to respond. I’m sure that as provost you live on the receiving end of a firehose of correspondence, as do I as a professor and a journal Editor-in-Chief. I’m sorry to have added to the e-mail overload. I appreciate your finding time to respond. It would be my hope that Stanford University would shoulder the responsibility of dealing with whatever harassment would come my way by virtue of my scientific and academic pursuits. Yes, when legal action is threatened, and staff are consumed with processing paperwork, I’m sure my Dean, Provost, and President would prefer to ransfer everything to me. However, the effect would be chilling. Universities are supposed to provide a haven to insulate scientists from harassment. I’ve looked at Dr.
Colquhoun’s publications via PubMed. He is a top drawer investigator. He is also a very public advocate for critical thinking. You note that Dr. Colquhoun “accepts that he needs to be in a position where he shoulders directly the burden of responding to Dr Lakin.” I applaud his fortitude, but note that are only 24 hours in a day. If the administrative resources of University College London are inadequate to respond to Dr. Lakin, how is Dr. Colquhoun, on his own, without the resources of UCL, expected to survive the harassment, legal hallenges, and other pressures to silence him? Again, I appreciate your responding to my e-mail. I hope that my perspective is a least thought provoking on the complex mutual responsibilities between a prestigious University and an equally prominent faculty member with outspoken views. Saturday 9 June 2007. The wires (and my hit counter) are melting after Ben Goldacre’s comments on the move of this web site from UCL’s servers. That’s understandable: his excellent badscience.net site gets 12,000 hits a day and 95,000 unique visitors per month. Like all the other comments, his badscience column in today’s Guardian, was not solicited by me, but it’s wonderful to know that somebody cares. His badscience.net version (“The Mighty David Colquhoun” !) was even more over-the-top. I can’t say I’m feeling very “mighty” at the moment. Goldacre’s piece starts “I’ve always said you’d get a lot more kids interested in science if you told them it involves fighting – which of course it does.” A correspondent today enlarged on the theme “you have got me thinking and yes my kids would be far more interested in science if a playstation game was created whereby Prof. Colquhoun was zapping disgruntled alternative therapists”. The mind boggles. Making money out of selling mindless violence (in the news again today) must be even worse than making money out of selling useless pills. A university should be one of the few places left where one cannot be accused of knowing the price of everything, and the value of nothing. Contrary to what some people seem to think, I don’t enjoy rows. They keep me awake at night. But some things are just too important to duck out of them. Goldacre has posted the complete text of the provost’s reply to one of the many people who have written to him. You should read the other side of the story too (click here and search for “letter from provost”). Grant has a real problem. He shouldn’t have to spend time fending off herbalists. Yet if they aren’t fended off, more attacks will occur. Who’d be a provost? That is all sorted out now.